A high ranking former Turkish soldier says that Turkey’s operation in Syria to secure the border area will not be limited to the town of Jarablus. The former head of the Turkish General Staff Intelligence Department, Ismail Hakki Pekin, spoke to Sputnik about the Turkish operation to liberate the Syrian town of Jarablus and what lies ahead for the Turkish and US- led coalition. According to Pekin, the operation was launched in Jarablus after reaching an agreement with the United States, Russia, Iran, and Syria. 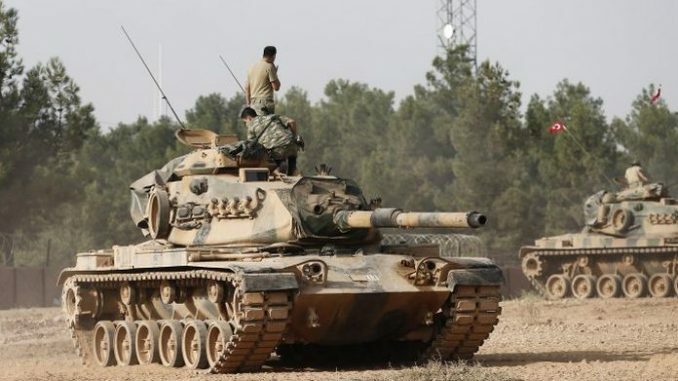 He further said that through operations in Jarablus, “Turkey intends to ensure the security of the border areas, as well as to prevent the formation of the ‘Kurdish corridor’”. “The operation is not limited to Jarablus. I cannot say what will happen next. Will the United States agree to break the southern corridor? That is a separate issue. But we must remember that after Manjib, there is al-Bab,” Pekin said. “This town is a gateway, leading both to Aleppo and Raqqa. Most likely the Americans want to clean up the area to al-Bab, to prepare for the operation to free Raqqa,” the former head concluded. On August 24, Turkish forces backed by American airplanes launched an operation in the northern Syrian city of Jarablus. The offensive was dubbed “Euphrates Shield” and was backed by a US-led coalition. President Recep Tayyip Erdogan announced that the operation was aimed against Daesh militants and Kurdish forces. The operation came after a terrorist attack in Gaziantep last weekend which killed over 50 people. The Turkish government blamed Daesh for the attack. The Turkish operation was backed by an international coalition led by the United States. Paris attacks: Did the French know about the planned atrocities in advance? ANOTHER Mars Photo Anomaly: Crashed Star Wars “Star Destroyer” Spotted?